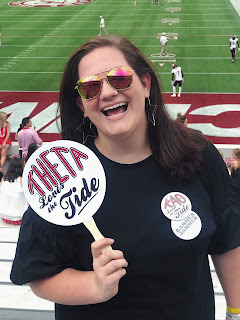 I am not an Auburn fan, and I don't own a ton of orange, so naturally I asked my best friend Natalie aka Naddles to help me out this post since she is an Auburn fan! If she ends up at Auburn for school, I will definitely visit and go to game, but until then, I will keep loving Alabama and AJ McCarron more. The Tigers have two national titles, the last one in 2010. Last season was one of the greatest turn around stories in college football. Auburn went from being the worst to playing for the National Title. Auburn's colors are navy and orange. Toomer's Corner. Jordan-Hare. War Damn Eagle. Auburn is a university rich in tradition, and that's hard to deny. (Even if you yell Roll Tide. Sorry Bama fans.) I know a few people who go to Auburn, and from what I've seen/heard, the atmosphere is insane. For this outfit, Natalie wore her favorite dress (and mine). It's a beautiful navy with red-orange details. Naddles rocked the #topknot because we all know what heat can do to hair, and she added an adorable navy bow. Throw on some cute sandles, and bam, you're ready to yell War Eagle! Look how pretty my best friend is!